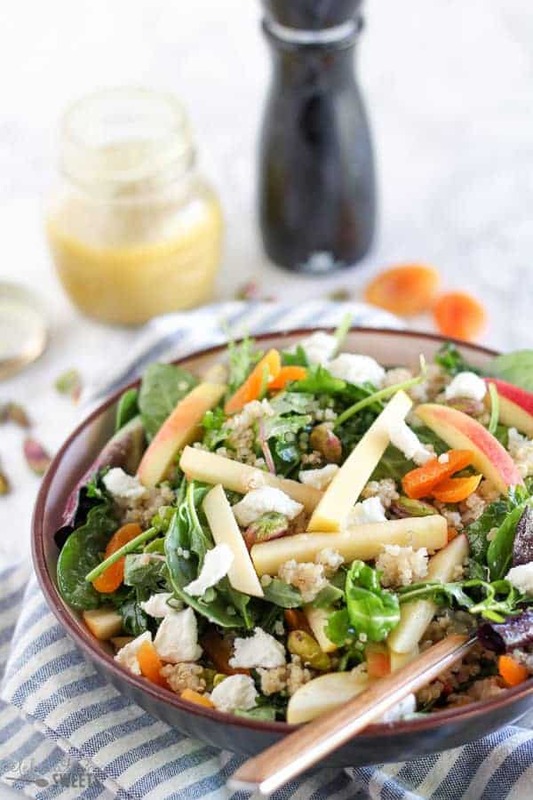 Healthy Lunch Ideas for Adults and Kids – No heating or microwave needed; everything can be served chilled or at room temperature. Use my printable recipe list to mix and match hundreds of lunch combinations. VIDEO and PRINTABLE BELOW! 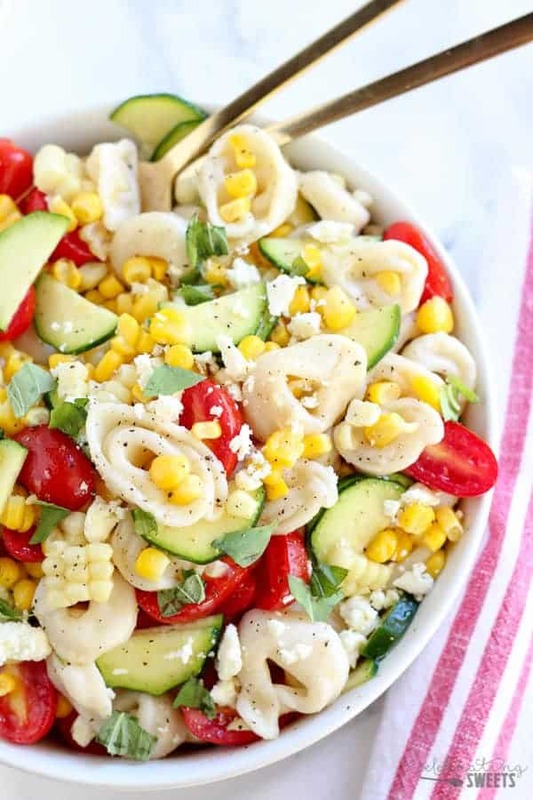 If you’re in need of some lunch inspiration – I feel ya! 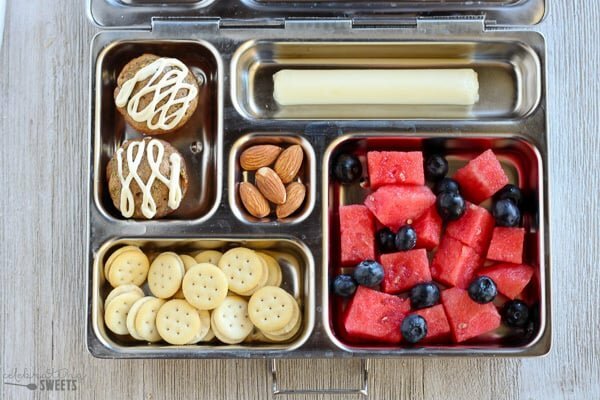 My kids have already returned back to school, and I am currently living the hustle bustle of drop off/pick up, pack lunch, grab a snack…go go, go! One thing I know, is that our days run smoother when I have taken the time to prepare nutritious meals and snack. 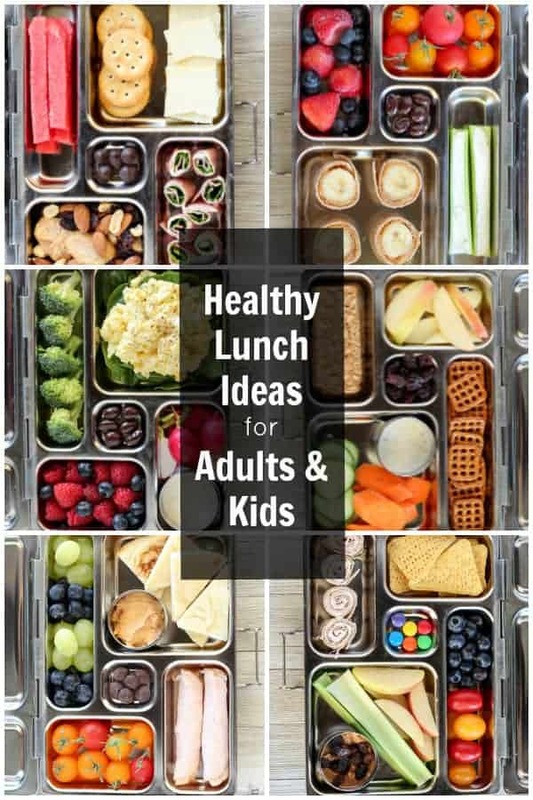 I love using these ideas to help vary our lunches. 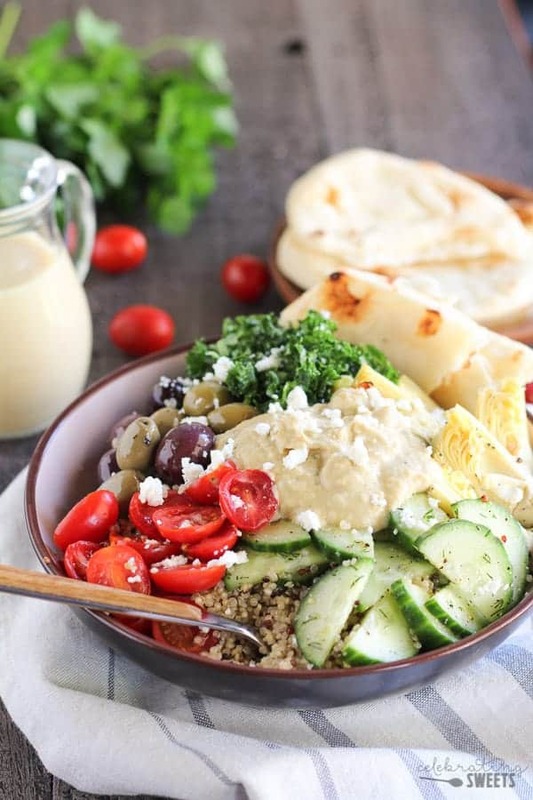 These are some of our favorite healthy lunch combinations. Feel free to mix and match to suit your tastes. Check out my printable “recipe” list with different categories for creating a well balanced lunch. Note: see below for details on the lunch container I used in these photos. 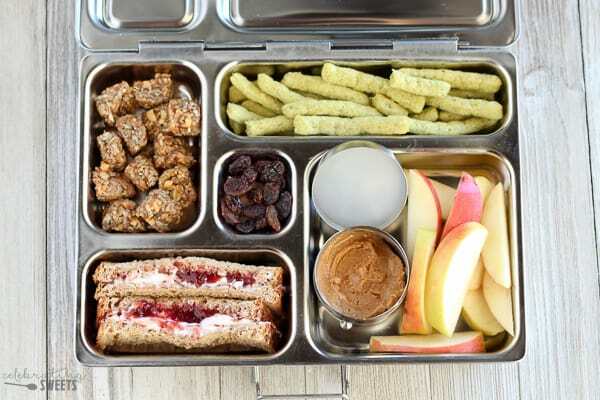 NOTE: If packing lunch for school, make sure that you are aware of any peanut or other food restrictions that the school might have in place. Any recipes including peanut butter can be swapped for another nut or seed butter, if necessary. LOOKING FOR A HOT LUNCH? SCROLL ALL THE WAY DOWN, I’VE SHARED SOME OF MY FAVORITE HOT LUNCHES (right before the recipe card). 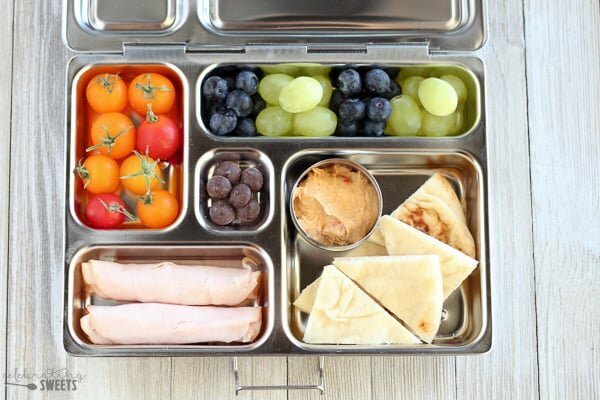 Cherry tomatoes, grapes, blueberries, hummus, pita, turkey and cheese roll ups, dark chocolate chips. Energy bites, cucumbers, carrots, crackers, cheese, strawberries. Raspberries, blueberries, broccoli, egg salad, radishes, ranch dressing, dark chocolate covered peanuts/raisins. Cherry tomatoes, celery with cream cheese, peanut/almond butter and banana tortilla roll ups, strawberries and blueberries, dark chocolate covered peanuts/raisins. 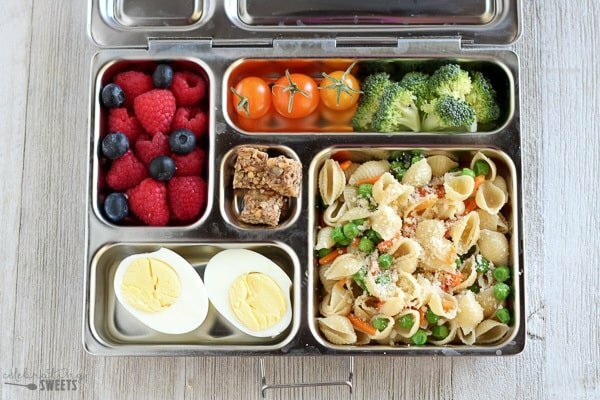 Raspberries, blueberries, tomatoes, broccoli, hard boiled egg, granola bites, pasta salad (pasta, olive oil, parmesan cheese, peas and carrots). Raspberries, graham crackers, salad, rotisserie chicken with BBQ sauce, mini oatmeal cookie. 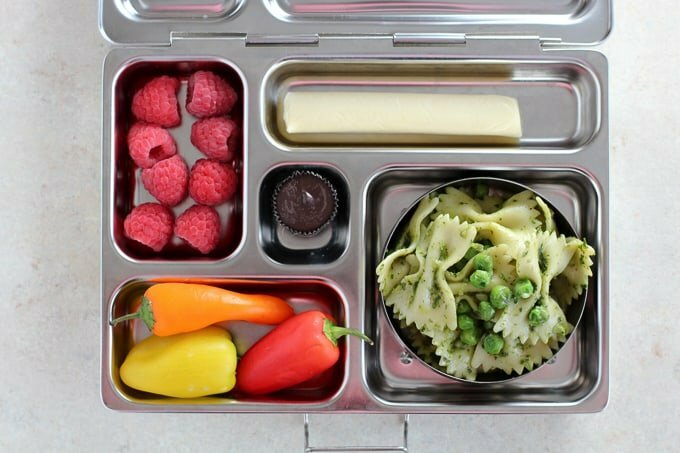 Pasta with pesto and peas (or tortellini salad), mini bell peppers, raspberries, string cheese, mini peanut butter cup. Tortilla chips, blueberries, tomatoes, apples and celery with peanut/almond butter and raisins, turkey and cream cheese tortilla roll ups, chocolate candies. Cranberry walnut chicken salad, cheese, bbq chips, strawberries, carrots, mini M&M’s. 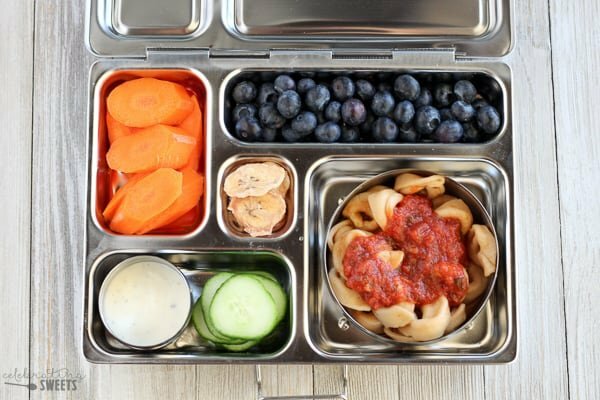 Carrots, blueberries, tortellini with marinara, cucumbers with ranch, banana chips. 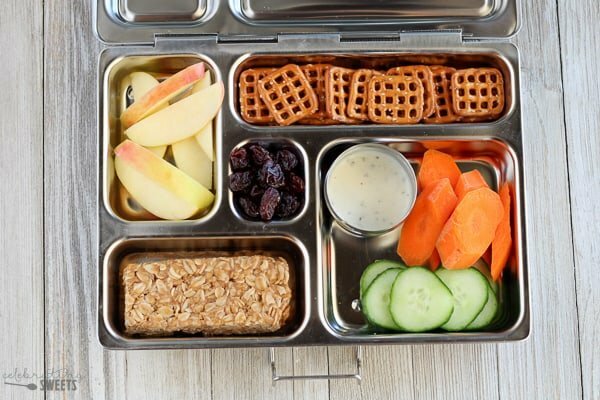 Apple slices, pretzels, carrots and cucumbers with ranch, peanut butter granola bar, dried cherries. Granola bites, pea crisps, apples with peanut/almond butter, cream cheese and jelly sandwich, raisins. Crackers, cucumbers, blueberries, turkey and cream cheese roll ups, cheese, raisins. 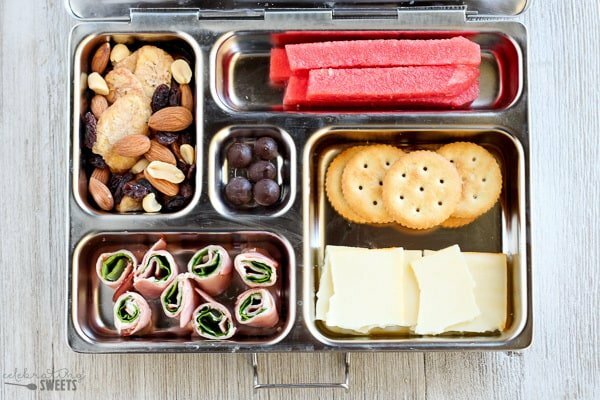 Trail mix, watermelon, crackers and cheese, ham and spinach roll ups, dark chocolate chips. Tortilla chips and salsa, fruit salad, almond butter and jelly sandwich, cheese, chocolate candies. 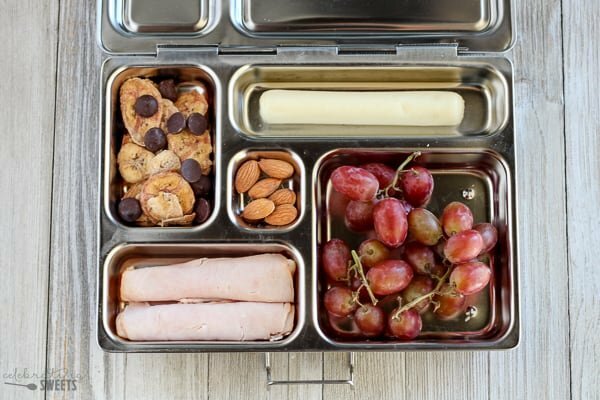 Banana chips and dark chocolate chips, string cheese, grapes, turkey roll ups, almonds. 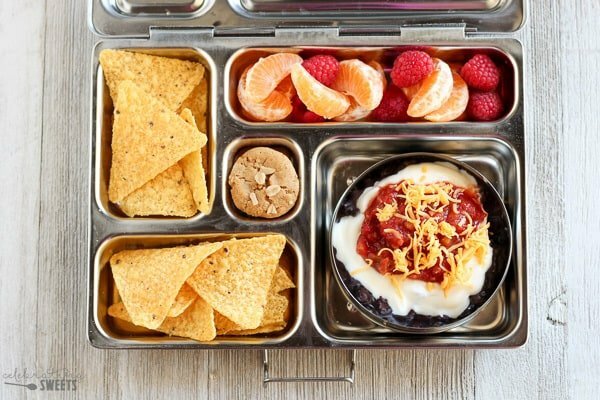 Orange slices, raspberries, Mexican bean dip (smashed black beans, sour cream, cheese and salsa) with tortilla chips, mini oatmeal cookie. Tomatoes, hummus with feta cheese, cucumber slices, crackers, chocolate chips. 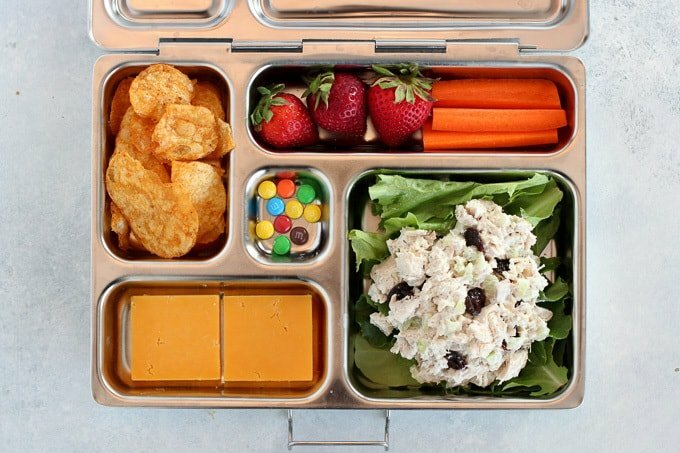 If packing lunch for school, make sure that you are aware of any peanut or other food restrictions that the school might have in place. 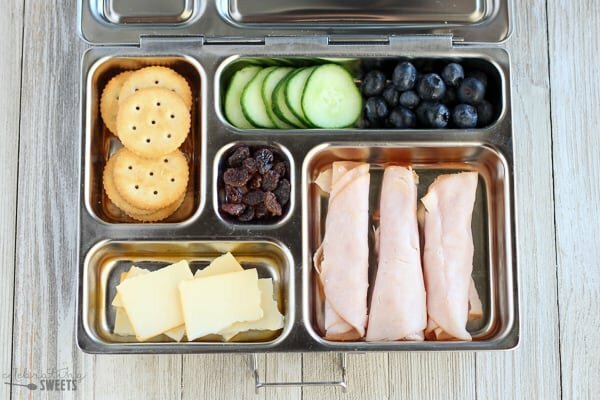 When packing lunch for yourself or your child, think about the other members of your family too. 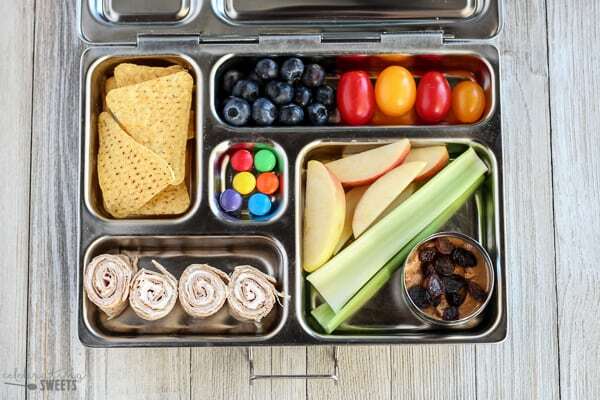 While assembling my son’s lunch I’ll put together a similar spread for my husband to take to work, or I’ll set aside some of the same food for my young daughter to eat at home for lunch the next day. While you’ve got all that food out, think ahead a little. It’ll save you time in the long run. Adjust the portion size based on whether the lunch is for an adult or child. When packing Jake’s lunch his portion sizes are smaller than those pictured here. Be sure to keep food safety in mind. Certain items listed will keep at room temperature but some will require an ice pack to stay cool. 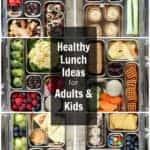 OPTIONS: Print the RECIPE CARD below for lists that you can mix and match to create your perfect lunch OR click here → LUNCH IDEAS PRINTABLE for a pretty printable to hang in your pantry or cabinet. In a lunch rut? 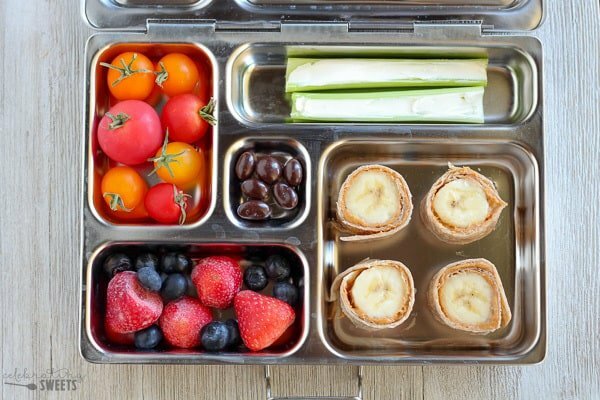 Here are healthy and easy lunchbox ideas for adults or kids. 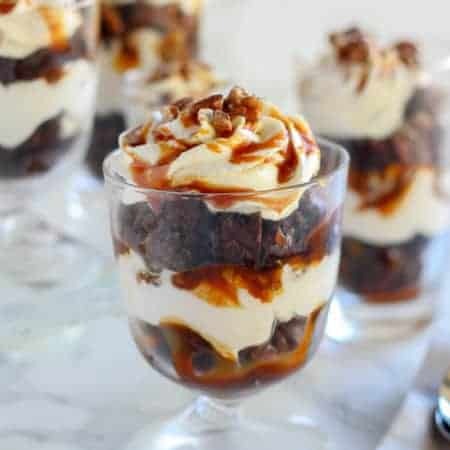 No heating or microwave needed; everything can be served chilled or at room temperature. 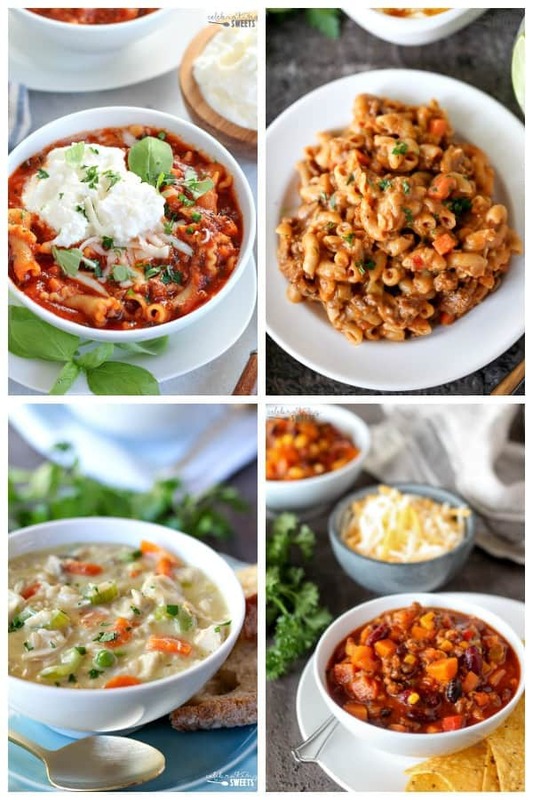 Use my printable recipe list to mix and match hundreds of lunch combinations. Grapes try them frozen too! 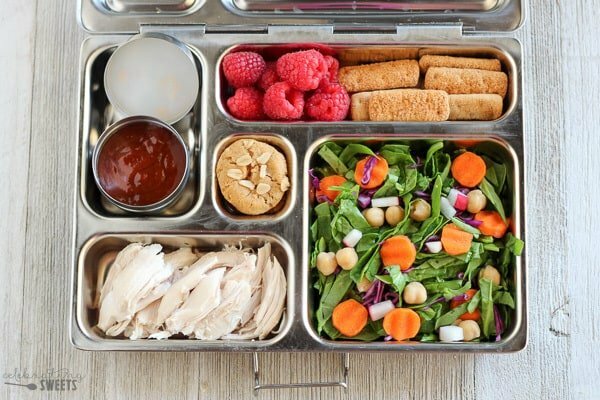 Mix and match ingredients from each category to create your perfect lunch! Nutrition facts vary based on what is served. Note: The lunchbox pictured is the Rover lunchbox from PlanetBox. All the food stays separated, nothing leaks or gets squished, it’s made from safe stainless steel, it’s eco-friendly, and it’s dishwasher safe. I seriously love it. PlanetBox was kind enough to send me the Rover lunchbox and bag in exchange for my review of their product. All opinions expressed are my own. My kiddos would love all of these ideas. It’s great for office lunches as well. Love your ideas! You make reference to 250 calories. Does that mean each lunch combination adds up to 250 calories? Thank you! Hi, Joni. Because there are so many combinations, I just included an estimate. The calorie count will vary based on how much and what exactly is packed. Where can I find containers like this? This came at a perfect time! My kids go back to school on Monday and I’ll be prepping lunches on Sunday. So many amazing options to keep it interesting. 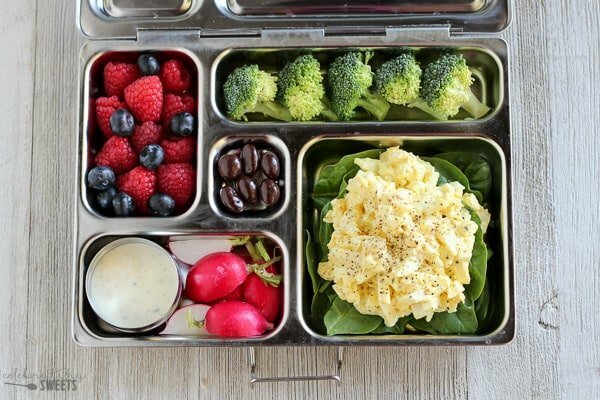 Love all of these healthy lunch ideas! Great tips too! 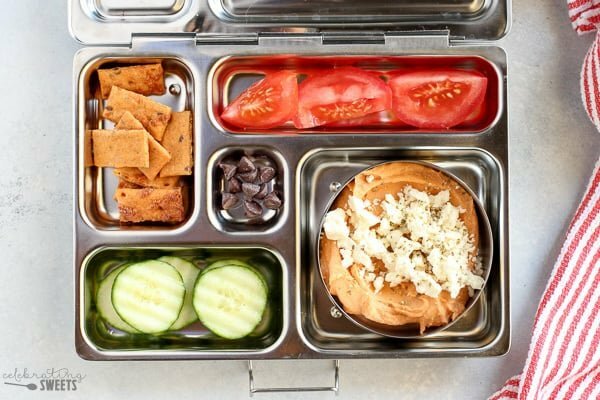 Wow, these are some seriously incredible lunch ideas for kids!! 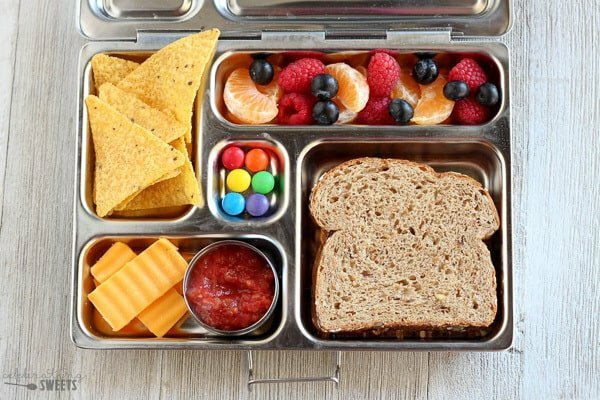 I was recently visiting my sister and she does something similar for her toddlers… They get fun new combos every day and it makes lunchtime so exciting! I’m in desperate need of more healthy lunch ideas. These are great! 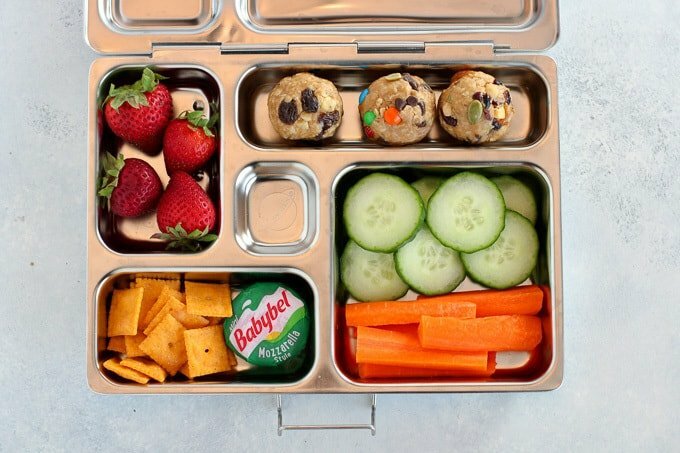 So many great lunch box ideas. My kids are all grown up now but this would have been so useful when they were still at school. Great post for school kid mums! I love every single combination of those snack boxes. Celebrating Sweets is a participant in the Amazon Services LLC Associates Program, an affiliate advertising program designed to provide a means for sites to earn advertising fees by advertising and linking to amazon.com. All images and content are copyright protected. Please contact me for permission to use my original images. 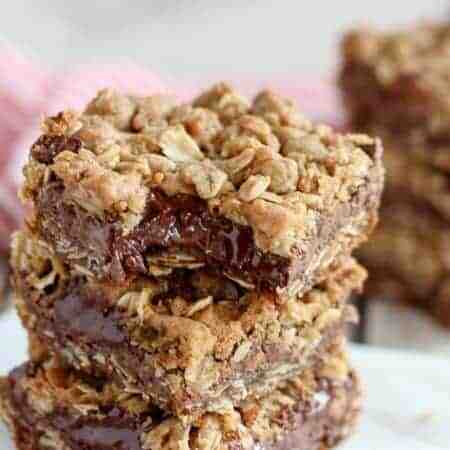 If you want to republish a recipe, please re-write it in your own words, or link back to my post for the recipe. Celebrating Sweets is a participant in the Amazon Services LLC Associates Program, an affiliate advertising program designed to provide a means for sites to earn advertising fees by advertising and linking to Amazon.com. 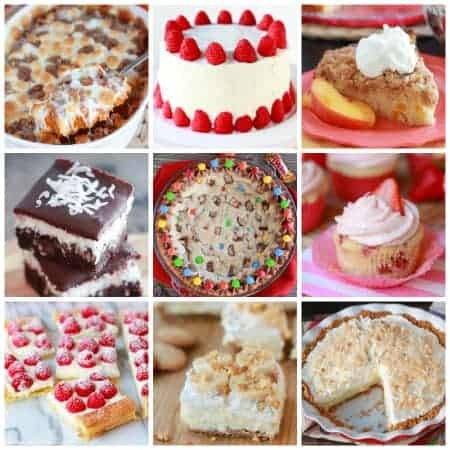 Thank you for supporting Celebrating Sweets!